Following the success of last year’s first commissioned artist digital residency, we are pleased to relaunch the opportunity for Autumn 2018. Over three weeks in September 2018, Arts Catalyst invites a practicing artist or curator to take over our Instagram account. We are particularly interested in hearing from individuals with a proactive, demonstrable interest in transdisciplinary artistic inquiry that connects with some of our current strands of research, including science in society, and themes of migration, ancestry, race, biometrics and systems of control. 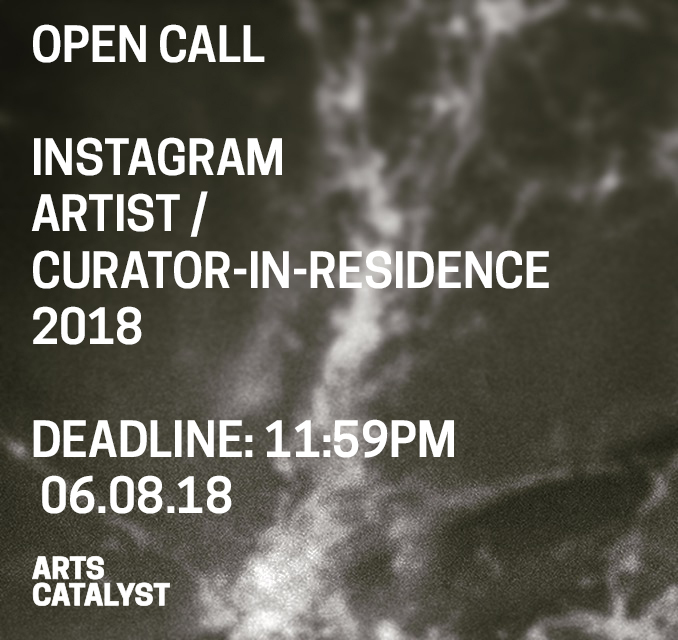 The selected artist or curator will be expected to present a series of posts, that might include work-in-progress, research, documentation of a new work/project, or visual experiments within the context and format of Instagram. Artists and curators from a wide variety of disciplines, working in any medium are encouraged to submit a project proposal. There’s also a possibility to develop a future project with Arts Catalyst, based on the research/work carried out during this residency. This residency opportunity forms part of Arts Catalyst's forthcoming programme, The Undisciplinary, a peer-led programme that will provide artists, curators and practitioners with a space for dialogue and learning in an informal, dynamic environment. The Undisciplinary will serve as a laboratory from which to discuss, develop and reflect on transdisciplinary practices and discourse. In 2017, artist Korallia Stergides was selected and used the opportunity to develop a new research-based project focused around a species of fish typically eaten in Cyprus and commonly referred to as ‘kourkouna’ in Cypriot dialect and ‘prosfigopoulla’ in Greek dialect (Προσφυγοπουλα ). Stergides documented her research on Instagram, conducting both visual and text-based experiments, and has since gone on to develop the project further, presenting research as part of performances with Siobhan Davies Dance among other institutions. Revisit the residency via the Arts Catalyst Instagram feed. Interested parties should send a proposal of no more than 500 words and a CV to opportunities@artscatalyst.org by 11:59pm on Monday 6 August 2018 with 'Instagram Residency Opportunity 2018' in the subject line. Please also complete the equal opportunities form downloadable here. ALL DOCUMENTS MUST BE IN PDF or MICROSOFT WORD - please do not copy and paste your application into the body of an email. – The selected artist / curator will be expected to post at least one image per day as part of the residency along with accompanying descriptive text. – They will also be expected to help maximise digital audiences by working with Art Catalyst’s communications officer to utilise agreed hashtags etc. – Applicants can be based anywhere but should be planning to be in London during these dates. – Applicants must be at least one year out of full-time, undergraduate education (for graduates from further education this year does not apply) and must have exhibited or curated previous projects / be able to supply a professional portfolio. – Meetings with curatorial staff, and Arts Catalyst's networks (e.g. scientists, academics, and artists from major institutions and potential access to scientific spaces). – Potential to use Arts Catalyst’s project space and equipment as well as the possibility of developing a future project together. – The fee of £500 is all inclusive to be spent at the discretion of the artist / curator (materials, travel and production costs). Arts Catalyst commissions and produces cross-disciplinary art and research. We activate new ideas, conversations and transformative experiences across science and culture, engaging people in a dynamic response to our changing world. Through working with artists, scientists, communities and interest groups we produce projects, artworks and exhibitions that connect with other fields of knowledge, expanding artistic practice into domains commonly associated with science and specialist research.